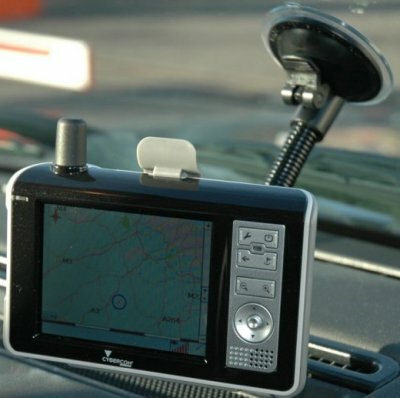 Personal Navigation Devices (PND's) are coming to market thick and fast at the moment. 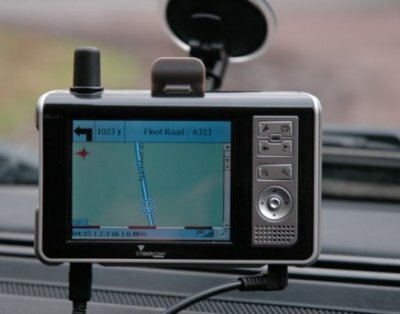 Garmin lead the way with their StreetPilot range and many more have subsequently appeared including TomTom's GO, Navman's iCN510 and Navigon's BlueMedia devices. 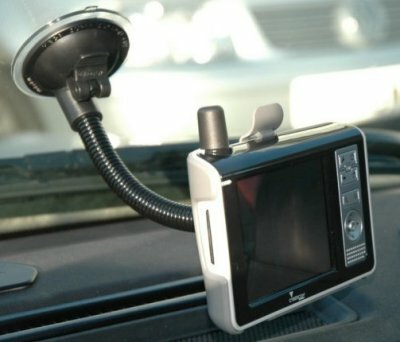 Medion already have a major presence in the Pocket PC and Pocket PC-GPS arena and their products have been available in the ALDI chain of discount grocery stores across UK and mainland Europe, the car accessory retailer Halfords here in the UK and Medion's On-Line E-store. 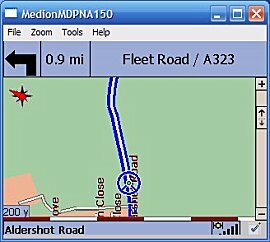 Now they too have released a PND based on the Mitac Mio 138 reference hardware design which is also used by Navigon. 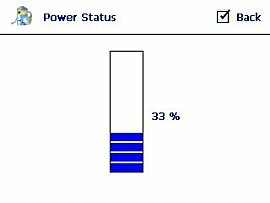 As I mentioned earlier, the MDPNA150 is in fact a Mitac Mio 138 running WinCE.Net 4.2. This should not be confused with Windows Mobile which although related is altogether different. 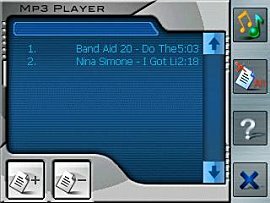 Out of the box the unit hides the underlying operating system completely (more of this later) and boots straight to a welcome screen that gives you only three options, Navigation, MP3 Player and Settings. The unit itself is very well made and feels sturdy and robust. 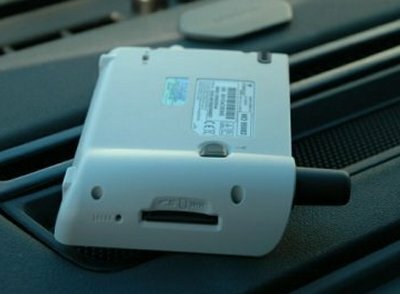 The GPS antenna is a fixed helical type and the receiver runs the SiRF XTrac 2 chipset. The MDPNA150 uses a PXA255 Xscale processor running at 300 MHz and comes with 32Mb RAM in addition to that provided by the storage card. The dedicated hardware keys to the right of the display are back lit when pressed and the screen itself is bright and clear. Working our way around the unit, on the right hand side is the telescopic stylus, volume jog wheel and headphone jack, on the bottom edge is the power connector and USB Sync port and on the left is the SD/MMC Slot and soft reset button. 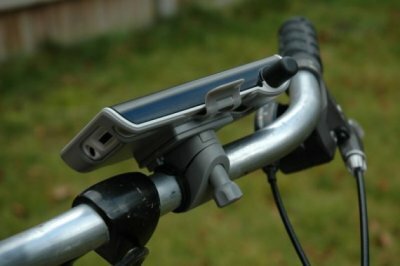 On the rear you will find an external antenna socket covered by a rubber bung and a master On/Off switch that enables you to perform a hard reset. 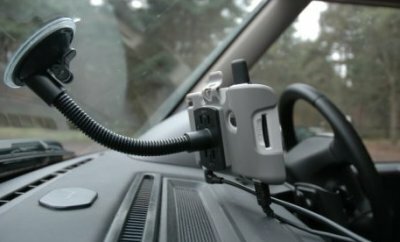 The supplied mounting bracket uses a suction cup with a flexible arm that connects to a dedicated plastic cradle into which the unit clips. This cradle holds the unit firmly and it clicks in and out easily. The only problem I have with this arrangement is the flexible arm which is slightly too long. 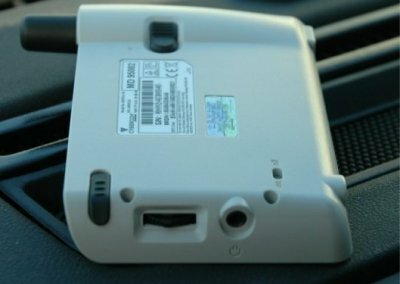 Unless you situate the arm in a position that allows the unit to rest on the dashboard it vibrates and shakes and this makes the display difficult to see. 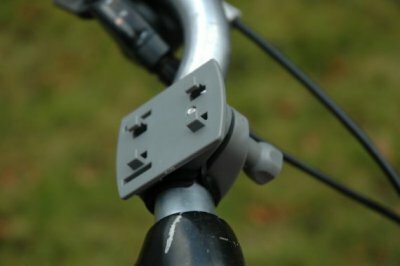 Unusually, Medion have also included a handlebar bracket for a bicycle (I say bicycle here because the bracket looks too small to fit around a motorcycle's handlebars but it may be possible), the same plastic cradle used in the car mount affixes directly to this. 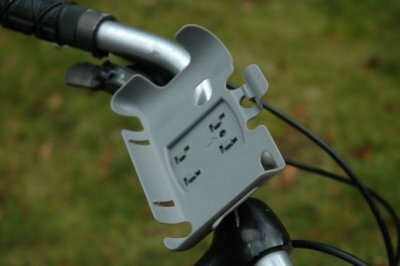 I'm not sure how practical this option is though, the device is neither water nor shower proof and I don't know how many keen cyclists have a need for a road navigation device but it is an accessory that some may find useful! 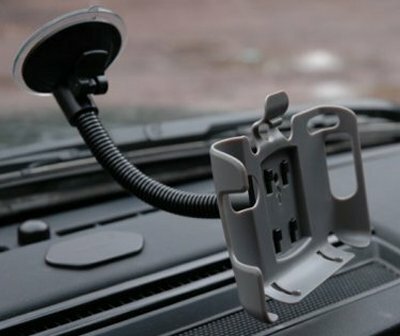 The fixed helical antenna works well in use although as with all such fixed/built-in antennas you may experience reception issues in vehicles that have anti-glare coatings on the windscreen. 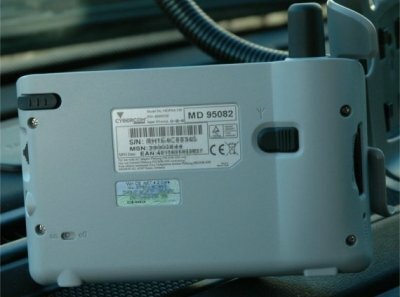 In such a situation you can however use an external antenna and for this purpose an external MMCX antenna socket has been provided although the antenna itself will have to be purchased separately. These are readily available and relatively inexpensive. 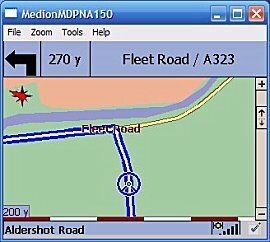 The MDPNA150 comes with a customised package derived from the latest Destinator v3. I won't go into too much detail here as Dave Burrows has already covered the product in great depth here. 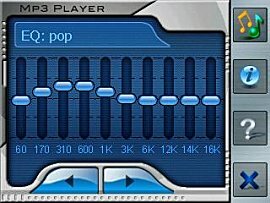 Instead I will detail the differences between this and the Pocket PC version as well as any features specific to its implementation here. 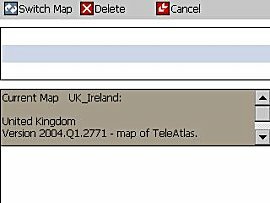 Map data is supplied by TeleAtlas and is signed as being Version 2004.Q1.2771. It does contain the M6 Toll Road although not the Silverstone bypass. 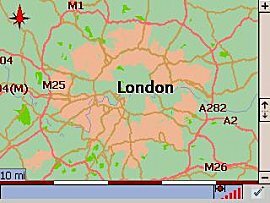 The entire UK & Ireland road map including the Quick Install .cab files consumes approximately 162MB of the supplied 256MB MMC card's storage space so there is a little free room for MP3's etc. 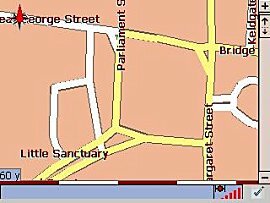 Display options for 2D/3D map styles are present although in 3D mode the 'Birds Eye' view option is not present. 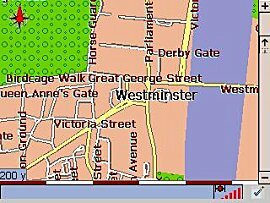 As in the Pocket PC version, the text labels for roads in the map display do not appear and all roads, major or minor assume the same grey colour in 3D mode which in my opinion detracts a great deal from its usefulness. 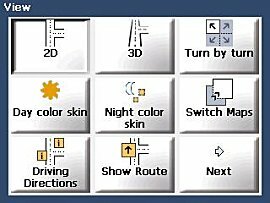 The good news is that the 2D mode is superb, different road classifications are clearly displayed in their own colour and intersecting roads are clearly labeled with their names. One issue that I did observer is that there can on occasion be rather too much detail on screen. 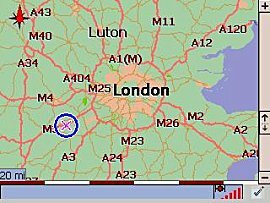 Whilst driving around the M25 I noticed that nearby towns and housing estates were all displayed in full details with all their minor roads. 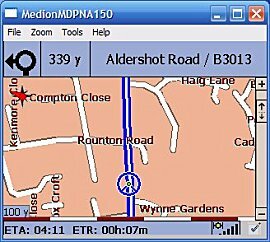 This can make the screen very cluttered indeed and is unnecessary, It would be far better if the detail level dropped automatically as speed increases, other systems handle this well and comparison with the map of a competitor product at the same point showed that they had removed all minor roads and showed only the M25 and approaching major intersections and nearby main roads. This is a small point but worth mentioning as it can on occasion be difficult to discern your position on screen amongst all the clutter. Power Obvious I know but this switches the unit On/OFF! 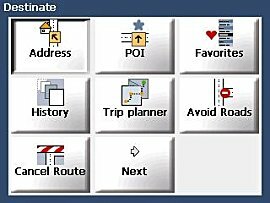 Navigation Menu Clicking the Flag button brings up the main menus from where you can enter a destination address, look-up a favourite, set avoids and adjusts other display preferences such as 2D/3D modes and Day/Night displays. Zoom Out This zooms the map view out. Zoom In This zooms the map view in. Return This returns you to the map display. 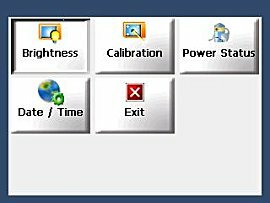 Settings Access to the MDPNA150's Settings menu from where adjustments to screen brightness, date/time and screen calibration can be made. 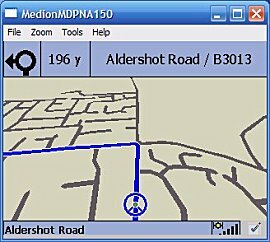 Although the map data is pre-installed on the memory card Medion do supply software for the PC that allows you to install the map data to an alternative memory card or should you wish, install a smaller sectional map i.e. 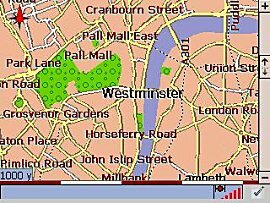 London or SE. There is also the further option of 'cutting' the map to create your own custom sectional areas. 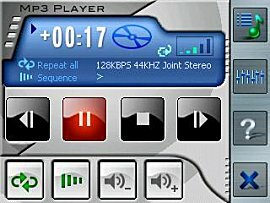 One other thing that is slightly out of the remit of this review is the MP3 Player application which is supplied with this unit. 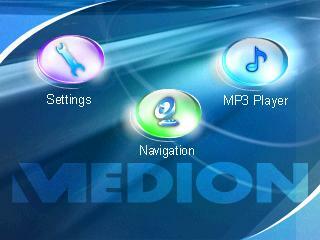 Medion supply a nice pair of ear bud type headphones that have an in-line volume control for use with this application. There is little to say other than it works well, there is the usual play list although there is no facility to customise the play list by genre etc, an equaliser is provided that can be manually configured to taste or you can choose from a wide number of presets for different styles of music. 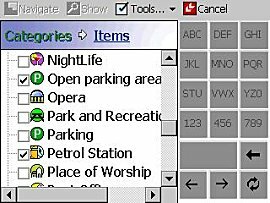 Address entry is slightly different from Pocket PC because there is no keyboard either real or virtual. 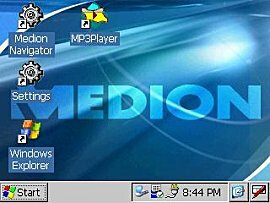 Instead Medion have opted for a system that uses a simplified input method similar to that used on mobile phones for text input. The alphabet is catered for by 9 on screen keys with each having three letters. E.g. Key 1 is 'ABC' so to enter the letter A you would tap the button once, to enter the letter B you would tap the key twice etc. This does allow for larger keys on screen that can be easily tapped but it can make input rather slow and frustrating, this may of course be welcomed by the texting generation but I would prefer a full QWERTY keyboard! Address lookup works well and the software identified all the addresses I cared to throw at it. As you would expect, when entering a destination you first enter the City followed by Street and finish off with the House Number. As you enter the information the list of available matches automatically narrows down and you can stop typing and select the correct City or Street from the list at any time. 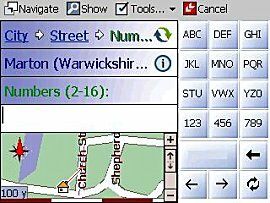 Once you have entered the Street Name and the House Number selection remains a small map appears showing the road you have selected and this acts as an aid to confirm you have chosen the correct destination in addition, the available range of house numbers for that street is displayed. 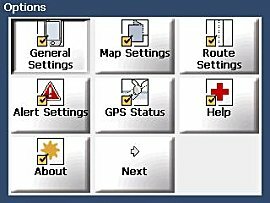 Once you have done all that, select 'Navigate' and the route will be calculated from your current GPS position. Long routes can take some time to calculate, standard test route of some 300 miles took 20 seconds which although not worryingly lengthy is still slow in comparison with other systems. The map display in navigation mode is well laid out and a model of clarity. The top of the display provides information on the road you are currently traveling along as well as a turn icon and distance to next maneuver. The bottom of the screen has a status bar that alternates between providing information on current speed and altitude and ETA and Time Remaining. The active route is highlighted in Blue and as you approach each turn a loud clear female voice instructs you on the next junction or maneuver. Routing appeared to work well, there were a few quirks where routes were completely different to those expected but in general it appears to choose routes identical to other packages using TeleAtlas map data. Should you wander off the planned route it recalculates quickly and although it will initially attempt to guide you back onto the originally planned route it will quickly recalculate a new route to destination if you persist in ignoring it! 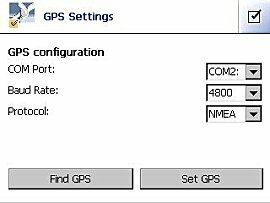 Accessed from the main menu, the GPS Status Screen provides a graphical representation of the reception situation. Each satellite that the almanac indicates should be visible is indicated on a spoked wheel diagram with a green spoke radiating out to those satellites when a 3D fix has been obtained. 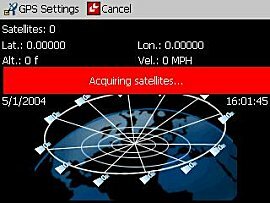 Above this is information on the number of satellites in view and the Lat/Lon data. Entering my home and office as Favourites is simple but to set either as a destination is more complicated than it need be. 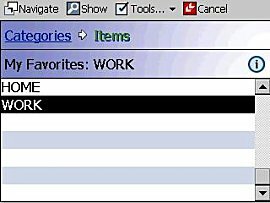 To select a favourite location as the destination requires that you call up the menu, select favourites, ensure 'My Favourites' is highlighted, switch the view to 'Item's' (it always defaults to 'Categories') and finally select 'HOME'. This really should be a one or at most two click operation. I have not succeeded in getting our safety Camera Database working with this software. It is theoretically possible but it is far from straightforward, I will however continue to work through it to a solution that works. In the meantime, If anyone succeeds in managing this I would be grateful for an explanation of how they did it! There is a comprehensive selection of POI's supplied with the package; these can be accessed from the POI menu from where you can choose which POI's you wish to see on the map screen. Out of the box this device hides the underlying OS completely, when you boot all you see is the Medion home screen with buttons for GPS, Settings and MP3 Player only. However, underneath runs a full version of WinCE.Net and it's a relatively simple procedure to modify the unit to boot to the WinCE desktop. And if it all goes awry, all you need to do is hard-reset the device to return it to its previous state. Credit for the solution goes to our friend Guillaume from www.GpsPasSion.com, whose original guide was published in French he has kindly translated this into English and it can be found by clicking here. There are many applications that will install on this device, e.g. OziExplorer and many that will not because of the differences between Windows Mobile and WinCE. You won't harm your device by trying and over time I'll compile a list of those that have been tested and work. The software itself could be a little better but you quickly become accustomed to it. 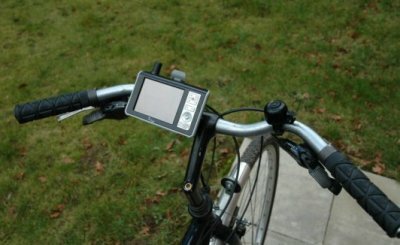 I like the hardware very much; it has a good screen, sensitive GPS receiver and decent battery life. I find I prefer the landscape format display this unit has despite a portrait format displaying more of the road ahead. I'm told that because we see the world in landscape our brains prefer information to be displayed in this format and who am I to argue as this does appear to be the case. 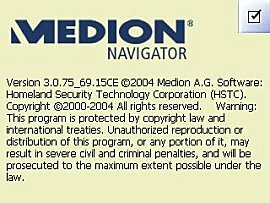 The downsides for me of the PND format are that you are restricted to the software supplied with the unit. Despite the fact that you can modify this unit to gain access to the underlying OS manufacturers are unlikely to make software available on its own for this format and so you cannot upgrade to better alternatives as they become available. 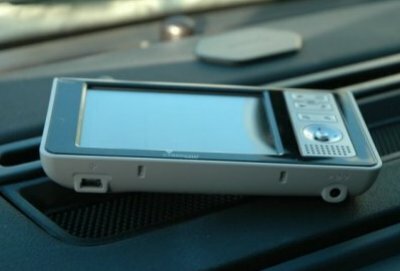 This affects all PND devices and is not unique to the MDPNA150. 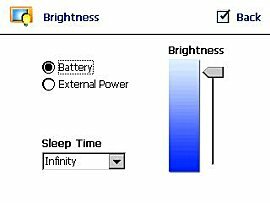 The upside of the PND format is that even if the batteries totally discharged the software auto installs after power has been re-applied and so it is great for occasional use unlike a Pocket PC which requires re-installation of software, configuration etc before it can be used. 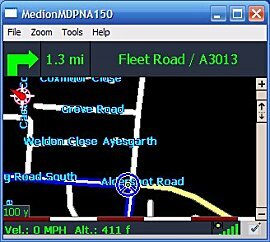 Navigon's BlueMedia device is just under £50.00 more expensive, uses identical hardware and does not provide access to an MP3 Player making the Medion unit a cheaper option albeit with UK and Ireland mapping only, unlike the Navigon BlueMedia who bundle European Maps. A nice self contained system that is easily pocketed.